For all the ladies trying to get their sweat on at the gym: you go girl! Going hard at the gym or your fave yoga class should be stress free and fulfilling, so you definitely shouldn’t have to worry about sweating during a sesh. 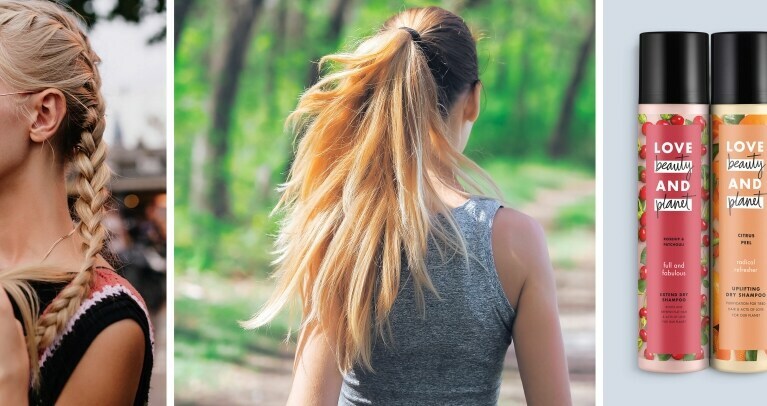 We all know that feeling in the pit of our stomach when we go to see what we are looking like after our workout: will my hair be too sweaty to wear out for the rest of the day? Can I still avoid washing my hair? It’s understandable that you want to avoid a full-on hair wash after the gym, you might have work, head to class or run some errands and re-washing and styling your hair can take a long time. Not to mention that washing your hair as frequently as you may workout can be damaging to your strands as over-washing can dry out your cuticles. Now that we’ve got you all stressed out, we’ll give you the holy grail answer to your post workout hair needs: dry shampoo. This product will take your hair from damp and greasy to dry and smelling freshly washed in less than 5 minutes. Leave this in your gym bag and you’ll be ready to start the rest of your day right after your workout. Dry shampoo will become your must-have hair product when it comes to post workout hair without showering. This magical product is a powder spray that soaks up unwanted oils and leaves you with clean strands that look and smell freshly washed. The best part? There’s no water required and it takes less than 5 minutes to finesse. Say goodbye to greasy post workout hair with Love Beauty and Planet Rosehip & Patchouli Extend Dry Shampoo. This dry shampoo builds bounce in your hair and will refresh your style even after an intense workout! For an even application, make sure you hold the bottle about 4-6 inches away from your hair. Once sprayed, use your fingers to spread the powder around and remove any excess product. When working out, we know it’s key to have a tight and secured style. One issue with this is that you use regular hair ties to secure your hairstyles—which can cause creases and damage to your strands. Set yourself up for a good post workout hair day by using a crease-less hair tie. There are a few options: the hair ties that look like telephone cords, the stretchy fabric ties or even a scrunchy. Using one of these options will help keep your hair dent-less and ready for the rest of the day, post-gym. Sometimes you simply can’t avoid the shower after a workout, but that doesn’t mean you have to get your hair wet! Put your hair up in a high bun or use a shower cap to avoid wetting your style during a quick body rinse. For the girls who know they get really sweaty no matter the workout, we recommend trying a new style other than a ponytail. Ponytails can cause creases and also concentrate most of your oils at the root since it traps sweat. Try a style that won’t keep your sweat in just one spot, we love a good French braid style to help disguise just how damp your hair might be. This style is quick, messy and chic, need we say more? We love this style for after the gym because the messier it is, the better the style looks. When creating this look, simply start like you’re making a low ponytail, but on the final hair tie wrap, don’t pull your hair out all the way. As we mentioned earlier, French braids are a great style to rock during your workout and as a post workout hairstyle, too. This style does a great job of concealing sweat and transitions perfectly as a style for the rest of your day. High ponytails are one of the best quick and easy hairstyles for long hair. Creating lots of volume in your ponytail will take away any attention from your roots if they are still a little shiny. When creating your high ponytail, gently pull the outer strands away from each other to pull the hair tie higher up your head. This will create more volume on top. A half updo look is perfect for all hair types, and we especially love it as a quick and easy hairstyle for short hair. This style looks extra youthful on shorter styles and you can use bobby pins to secure any shorter strands that might not make it into your hair tie. We love this look post workout because it covers your scalp and creates a lot of fun volume. If you want to get a little fancier with your post workout hair, then try out a braided bun. Create this style by making a ponytail wherever you want to braid to be on your head (high or low). Once the ponytail is secured, you can either create a standard braid or a fishtail braid. Finish your braid and then begin to wrap it around the top hair tie to create a bun. Use bobby pins to secure your braided bun.